The base coat has ultramarine blue light added to the mortar. The top coat, when it's ready to paint, will have sections with a wide 'V' giornate cut and removed down to this base rough coat that I applied fairly smooth. 1-20-04, Four days later this is what the blue brick looked like. I'll test it next. Because of this ultramarine blue failure I am testing all colors in a jar of wet lime milk. Bad news.. both ultramarine blues turned white in wet lime, the cobalt blue deep turned a deep gray. These colors were bought from Zecchi. Senopia's Ultramarine Blue Dark for lime has a problem also, it turned lighter after 4 months on a mural. Only the thalo blue remained unchanged for fresco work. A later test of Cobalt blue Light stayed the correct color. 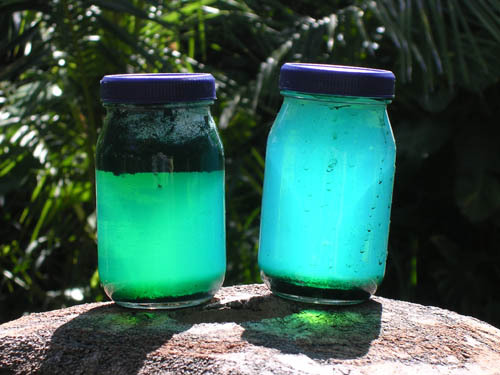 2-8-4 The next 3 color tested in a jar of lime are Cobalt Blue Light, Cobalt Turquoise and Cerulean Blue. Fifteen days later they were still doing great, they are line safe. New test, 4-18-4. Retest Zecchi Ult blue and ult blue lite, indanthrone blue, permanent red, Quin. violet, manganese violet, cobalt violet, quin coral. Both Zecchi ultramarine blues turned white. The only other colors that failed are D.S. 's Manganese Violet and Cobalt Violet, manganese violet turned dark brown, cobalt violet turned light brown. They are still good for fresco secco and all other mediums. Senopia's Ultramarine blue and dioxine purple arrived, The test has started, 4-25-4. 4-30-4, both colors are lime safe. Dioxine Purple became cooler toward blue in frescos done by the Waldorf School. 4-25-4 to 5-4-4, These new tests all kept their color. Priderit Yellow PT157 Senopia. Irgazine Green PY129 Senopia, Irgazine Red PR254 Senopia and Thioindigoid Red PR88 Zecchi. Irgazine green I store in alcohol, like thalo blue and green, quinacridone violet and quinacridone coral. You can see how poorly it did in water. It settles nicely in alcohol. D.S. Permanent red did well in water like the cadmium's and oxides. Dioxine Purple dissolved best in ammonia, like the earth oxides. Ammonia is a fungicide and a water wetting agent. 4-25-4 to 5-16-4, Quinacridone Coral turned warmer to yellowish, Quinacridone Red went brown and Napthol Red turned cooler toward magenta. Good colors, but not fresco colors. 10-13-04, all the Irganzine colors are lime safe. 10-30-04, PR122 by Sennelier is the perfect magenta and is very stable in lime. 10-30-04 Phthalo Green PG7 precipitated. This is important for fresco painters because they use dry pigments. The reason I made this test is because I wasn't satisfied with the painting quality of the pigment, I could see the darker side in washes and it tended to clump after it was ground just setting in limewater. It just wasn't a clean color. Now I will only use the precipitated PG7. It will be easier to wet and will give a cleaner green. This problem doesn't happen in other media because the pigment is kept in suspension. Here is the test and results. I separated dry PG7 Thalo green by adding water and gum Arabic to wet it, the mix was shaken and stirred, then left to settle. 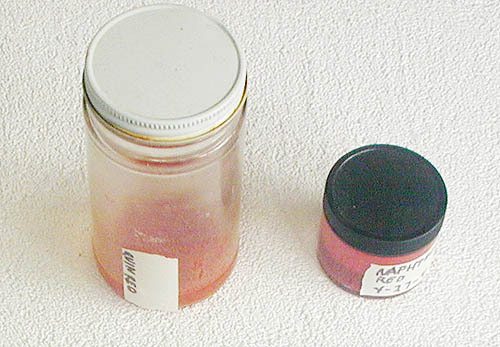 Here are the settled pigments in water. The floating pigment made an island, the top most particles dried. Remixed with arabic to make paint, "A" is what I got from floating pigment. "B" is pigment from what mixed with water and didn't float. "C" is the original dry powder in gum arabic. A. Shows a decidedly blacker color. B. Is a smoother painting pigment with no black appearance in the buildup. C. Clearly, this is a mix of the two. END PAGE The End Page is from today and goes backward. since July 4th, 2003. Welcome back!